Paracetamol products are limited to a total of 100 tablets/capsules per order. Due to legal restrictions, Pseudoephedrine containing products are limited to a total of 720mg. Products that contain Pseudoephedrine cannot be purchased at the same time as Ephedrine containing products. This product is limited to 1 per order. Night-time capsules aids restful sleep. THE COMPLETE 24 HOUR COLDS & FLU REMEDY. 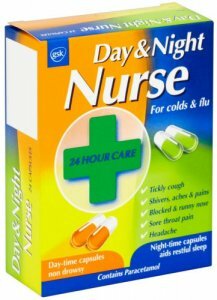 Day & Night Nurse capsules have been specially formulated to provide 24 hour relief from the major symptoms of colds and flu. 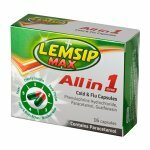 Each pack contains a combination of day-time (yellow/orange) capsules and night-time (green/white) capsules. 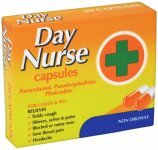 Day-time capsules quickly provide relief from the major symptoms of colds and flu without causing drowsiness. 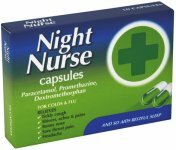 Night-time capsules also relieve colds and flu symptoms and help you get a good night's sleep to wake feeling better. 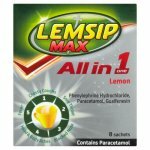 2 yellow/orange capsules, to be taken with a drink of water, every 4 hours, up to a maximum of 3 doses throughout the day, if needed. 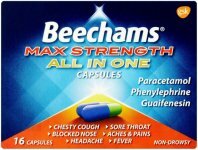 2 green/white capsules to be taken with a drink of water at bedtime. Do not give to children under 12 years of age. WARNING. DO NOT EXCEED THE STATED DOSE. Immediate medical advice should be sought in the event of an overdose, even if you feel well. May cause drowsiness. If affected do not drive or operate machinery. Avoid alcoholic drink. If you have liver or kidney disease. If you are pregnant or breast feeding. 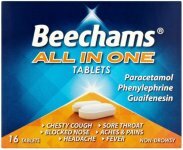 With other flu, cold or decongestant products. Contains paracetamol. Do not take with any other paracetamol-containing products. Before taking this medicine, if you are under the care of your doctor, or receiving prescribed medicines or have asthma, glaucoma or an enlarged prostate. If symptoms persist consult your doctor. Store in the original packaging. RevJoseph McIntyre Efficient service provided. Mrs Sue Moll I would thoroughly recommend Weldricks. The service they provide is excellent. They are totally reliable and the delivery is prompt. I also appreciate the way they keep the customer informed every step of the delivery. Rated 9.8 out of 10 based on 32365 reviews. See all reviews here.